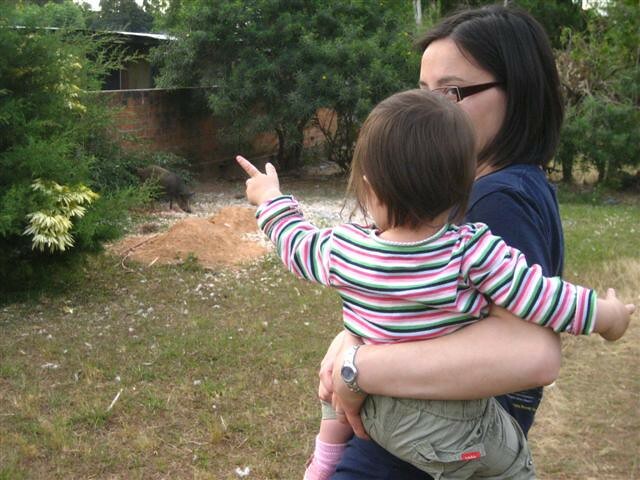 “pointing at the pig”, taken by Josh Wood near Mchinji, Malawi, 2008. All rights reserved. Giving advice is tricky… Everything’s subject to the particulars of your family, your fieldsite, your project, your level of tolerance for chaos, etc. Thus, this is not an “advice” column. This is a “this-is-how-I-see-it” column. I’ll start with my experience, since I know it best. We land in Malawi, tired after nearly two days of travel, and our bags are stuck somewhere in Johannesburg, with the potential of arriving in a few days time. We make do. My husband reminds me now as I write this just how incredibly lucky we were — we were in a place where we were essentially among family. A place where the Malawians knew us (we had been at the exact same field site, together, two years earlier and made friends) and liked us (or at least, they really liked my husband — and they all took to my daughter immediately). We also had an army of ex-pats staying there with us. Though most were clueless about what to do with a toddler, they were well-intentioned. A couple of weeks after we arrive, my daughter takes her first steps. In Malawi of all places! The place where I met and fell in love with her father. When we lived near the Shire River, we could hear hippos at night. A neighbor friend who acted like an older brother to our daughter could imitate their sound perfectly, and it would make her (and us) laugh. We drove her on a safari where we saw great elephants and giraffes and even warthogs. We carried her on hikes of Zomba Plateau and Mount Mulanje. She would dance when our nanny’s group of friends would get together and sing. It was all pretty magical. In the seven months we lived in Malawi, there were three times my daughter needed a doctor. The first time she was really ill: fever, diarrhea, vomiting. We took her first to the district hospital and were attended to by the District Health Officer himself (he was a medical doctor in addition to being an administrator). There, she tested positive for Malaria. I was convinced the test was wrong. She wore long sleeves and pants all the time. She was taking a daily course of pediatric Malarone. She also either slept in bed under a bednet with us every night, or in a fully enclosed baby travel cot. I asked the doctor what the chances were of a false positive; he looked himself at the slide (it was a lab test for Malaria, not a rapid test) and decided that there was too much debris on the slide to give a conclusive answer. We tried giving her oral rehydration therapy and thought if it were a virus that she would slowly improve. She refused to eat and started to lose weight and by the end of the third or fourth day, she was lethargic. My insurance company (located in the states) wanted us to drive across the border into Zambia to an Adventist hospital (they didn’t realize how challenging that would be) and told us that if she wasn’t better by the next morning that they would medevac us to South Africa. I couldn’t believe there wasn’t a doctor good enough in Malawi to treat her and I didn’t think flying to another country (and the time it would take to do that) would help matters. I was desperate. So, even though it is NEVER a good idea to drive at night, that night a friend drove us to the capital (Lilongwe) where we met a friendly American doctor working in a missionary clinic. He diagnosed her as having a bacterial infection (even fancy hotels in the capital can give you food poisoning–as they can in the states) and gave her a shot and she was already getting better by morning. That doctor is the primary reason I stopped talking trash on missionaries in Africa (but that is for another post). I can’t imagine what we would have done without him. A few weeks later, our daughter got sick again–this time with a terrible rash that would not go away. We were now in a different field location, far from the angel doc in the capital. I was told there was an excellent German pediatrician at the district hospital that was less than a two-hour drive from where we were staying, so I took her there. The people who told us the German doc was excellent were flat out wrong. We braved a much longer drive to return to the missionary clinic and again, the doctor was quick at diagnosing the problem and getting my daughter healthy again. In both of these situations where I disagreed with the first doctor(s), I am grateful that some wise woman once told me that mothers know their children best. In the first case, I knew she didn’t have Malaria, and in the second case, I suspected her illness was related to her course of antibiotics from her earlier sickness. Mother’s intuition and second opinions are underrated. I was lucky to have a well-trained doctor that I trusted in the country — even if it meant a long drive. Finally, just a week before we left Malawi, my daughter tripped and broke her arm. On Christmas Day. We had a friend in country who was a doctor and who spoke with us over the phone to determine whether it was okay for us to wait a day to see a doctor (it was and I don’t know what we would have done if it wasn’t because literally no one was available). We went the next day to a major private hospital in Blantyre (the commercial capital in the south of the country) and because she was so young, we were referred to Beit CURE, where she got proper X-rays and a cast the same day. Though we never managed to arrange having a go-to pediatrician during our trip in Malawi, we found two great docs when our daughter needed medical attention — one was a general practitioner at the missionary clinic (an American who had three young children himself) and the other was a fellow of the Royal College of Surgeons practicing pediatric orthopedic surgery at Beit CURE. Yes, it just so happened that when our daughter broke her arm in Malawi, she was attended to by one of the best trained doctors in the world (who also had three kids living in Malawi with him and his wife). “…I also weighed whether our growing family could withstand another long-term residence in these relatively remote, medically underserved villages. During our last stay, we had brought our six-year old son Nathaniel with us, and in three short months, he’d lost 12 percent of his body weight. While Philip and I wanted to give Nathaniel a sibling before long, bringing another young child to the Beng region any time soon seemed an increasingly distant option. We’ve always had our kids with us doing field work. Oldest was able to help teach shallow well installation and soil texture analysis in the field last year. He helped dig soil pits at age 7 or 8 in Kenya’s Mau Forest, and now impresses people with his knowledge of ecology and landscapes. We lived in Ghana (I was preggers there with our youngest), Kenya, and now Ethiopia with extended field work in the Limpopo Basin. The oldest began solo nonstop travel from US back to Ghana when he was 12. We did not take our two boys for field work in the Sudd after independence, however. Our youngest is 3 and oldest is now 17, and I cannot imagine not having them in the field. I or my husband wear the lil one on our backs because he likes to “go to work” with us. Usually he has a nanny though. The oldest has had Malaria and Cholera and we think may now be indestructible after surviving. So, when people ask me if it’s a good idea for them to take their family with them to the field, my response is usually silence. You’ve got to do what is best for you and your family. Will your kid get sick? Of course! Just like they would get sick if you didn’t take them to an African country. Because kids get sick everywhere in the world, not just in Africa. Contact researchers you know who have recently taken children with them on research excursions (ideally in the country/countries where you are headed). Get their insights — tell them you want the good and the bad. Figure out the vaccination and prescription needs well in advance and discuss options with your child’s regular pediatrician. Speak to your health insurance company about your pending trip and what they can offer in terms of medical evacuation, prescription medicines, etc. Find a pediatrician. A good one. This is a priority. Many of us American parents will research the best pediatricians for our children when we’re here in the US, sometimes even before our children are born. There is no reason not to try and find one wherever you’re going. I found doctors in Malawi using a list provided by the US Embassy to traveling Fulbrighters. If you’re not going to Malawi, it’s worth asking whoever it is in the Embassy of the country you’re going to that helps with coordinating Fulbrighters if they have such a list (even if you’re not a Fulbrighter). The list was awesome because it not only had landline numbers and addresses, it also had cell phone numbers. Perhaps to help you with the preceding point, find another expat mom in the country. These moms (just like the ones you meet at the library lapsit or the city park here in the states) can provide you with really great, hard-earned information. For all you moms and dads looking to take your families with you to do research in an African country, I hope you’re lucky, too. “Dinner Party”, taken by Josh Wood near Liwonde, Malawi, 2008. All rights reserved. * Road traffic accidents were the 9th leading cause of death in Malawi in 2011 and 26% of road fatalities in 2005 were of children under 18. Wikipedia has a page of countries by traffic-related death rates. As a comparison, the US had 12.3 road fatalities per 100,000 inhabitants per year and Malawi had 26.0. ** Malawi’s under-five mortality rate is more than ten times higher than that of the US. *** This is largely possible because my two previous, more lengthy trips to Malawi in 2006 and 2008 allowed me to make really good friends with Malawians who do research for a living. I know now that I can count on them to carry out research I plan or design. They probably even prefer I not be in the field, asking lots of silly questions, even over dinner and drinks when everyone is tired and doesn’t want to talk about work. Two years ago I brought my family to Nigeria where I am teaching at AUN. Like you, we had one really good doctor (Indian) for the first year and I’ve done more self-medicine than should have been necessary. Or our situation schooling has been the tougher problem and is why they will be back in the States this next year. A lot more is at our blog, joy meta.blospot.com. Yes, schooling would introduce a whole different set of issues. There were a few options in Malawi, much of the “easier” ones being located in the major cities. My husband and I have a tech start-up/NGO that develops apps for water and sanitation. We’ve always traveled with our kids abroad from infancy to adolescence, but it was usually on trips less than a month. This is the second summer in a row we’ve gone for the whole summer (US summer for school break = 10 weeks). They were 9 & 11 last year and they’re 10 and 12 this year. We mainly travel in East Africa, as we’re based in Mwanza, Tz–but that includes side trips to Nairobi, Addis, and Kigali. If the kids weren’t so immeshed already in the NYC arts (Broadway and ballet), I’d homeschool them and live here year-round. We absolutely love the time with them, but we always attachment parented and never nannied, so I think families not used to having kids next to them around the clock might not like it so much. But, as Tracy said, most of the time the kids are great lab assistants. Their favorite parts are never the parts people think they’ll like. They don’t notice it’s a great adventure or a unique opportunity. They live in NYC where the whole world is represented in their classrooms anyway. In fact, my son wants to visit his classmate in Addis, who is here visiting family. They like swimming (they were trained to test the pool for chlorine first, the pool guy loved that) and playing soccer all day. They have an annual summer reading contest and they each passed 1000 pages within two weeks of arriving this time, it took a month last year. We always drive to Mwanza from Nairobi because they love crossing the Serengeti so much. While we do use malarone, nets, and spray, the biggest worry, statistically, is not getting sick, it’s car accidents. We have to be sure they’re always in cars with seatbelts–difficult on a continent to which most manufacturers ship vehicles w/cut out seatbelts and airbags in order to save money on weight. We travel with our own seatbelts. And smoke detector. We always know where the closest high quality hospital is. I keep a pretty significant first aid kid–sutures, tourniquet, hemorrhage powder, and a suite of antibiotics we almost never need. Last summer, just as we arrived, my daughter got sick (vomiting) and I worried but it ended up being a reaction to her typhoid vaccine that went away after a few days. A doctor friend we have on call (email) talked me through my stages of worry. Later, my son had a blister that infected and, given the high pathogen load in water sources like puddles that kids can find themselves exposed to without knowledge, I worried but watched (again emailing dr friend). Applied topical triple antibiotic. A few days in, as it worsened and his temperature rose 1.5 degrees, I gave him cipro. I would never have to use cipro for an infected blister back home, and it may have cost him a spot on the soccer team because he was still limping for try-outs. But even this was small as far as incidents go. It’s difficult to never feel like I can leave them with a sitter–that has more to do with the likelihood of an accident than the safety of the sitter. But it’s resulted in them sitting quietly outside meetings in pretty awesome locations, like the UN compound in Nairobi or the Ministry of Health. I’m lucky they love to read and I reward them with DS time when they stay quiet. Adolescents are easy to reward (technology). I feel sad when I think of reaching an age when their summers are too busy with their own emerging lives to let us do this together. I travel a lot without them during the school year and it’s so lonely in comparison. Already, we put off an acting camp in upstate NY and my son asked us to go without him so he could attend. We said no, but how much longer can I have these dreamy summers with them? That’s part of the big shift from raising little kids to adolescents in general, though: suddenly you go from hoping they become more independent to wishing they weren’t so darn independent already. Wow, Annie. Thanks for sharing your experiences in detail for haba na haba readers! Tracy and I met up today in Addis! Thanks for introducing us. Among the most striking things she said was, “This is a kid friendly place, but not always a kid safe place.” She was talking about marble stairs without hand rails but I felt it was a universal statement. Great read! I would also add for people traveling with under 5’s to bring plenty of baby medicines. In many places, even big cities, they are so hard to find or may be of questionable quality. In fact, when people visit we often ask them to bring OTC baby meds. We also use our own car seat and don’t often take the kids on a lot of public transport due to accident risks. Finding a good doctor before things happen is something we do as well. For schooling, our oldest is doing the homeschooling option this year because it is his last year of high school and he is ahead in all subjects. He attended a private Ghanaian school when we lived in Accra because the American school was too expensive, and I think it was a good experience for him. He’s one of the few American teens I know who has a pretty decent background in reading West African authors. He was ahead of his peers in most subjects when we moved to Texas. He currently has an internship related to social media and development, so he keeps busy. For the baby we always hire a nanny. He’s a wild man! Here in our Addis neighborhood, he is well-known now because he goes out for long daily walks to the local markets with his nanny. I had to get used to him being showered with kisses by EVERYONE. He’s the best Amharic speaking in the family currently, but he’s only 3 so it is just part of his language learning now. We are cautious where our toddler eats, but our oldest eats wherever he sees fit. For him, if it is meat and it’s cooked, then he is eating it. Oh, and deworming. We deworm the whole family every 3-4 months. Especially when we lived in Ghana because meat is the order of the day all over West Africa. We like to get out in the countryside too and have always found lots of fun things to do wherever we live, be it hiking, camping, long drive, or animal watching. I’m not sure our oldest son yet realizes how much he has seen and done compared to his peers. Thanks, Tracy, for your comment here and for your help in crafting the post! 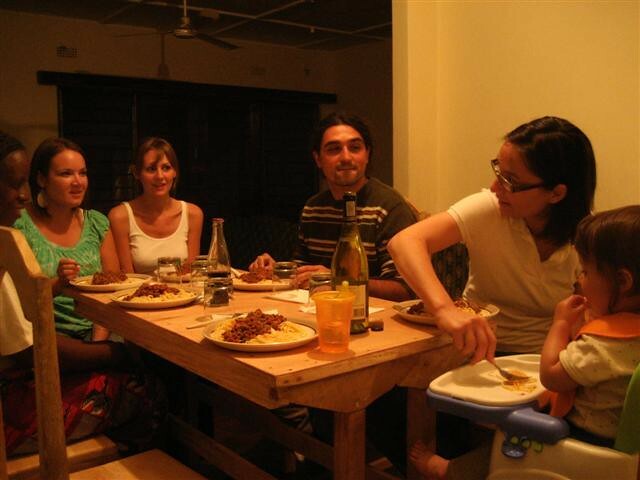 When we went to Malawi in 2008, we had bottles and bottles of Infants’ Tylenol and Infants’ Motrin. I knew it would be near impossible to find when we were there. We managed to have one last bottle of each on our trip home. Thanks for writing this. I wrote a piece on the same subject in Signs, sharing some of my own experiences. Might be of interest to your readers: Tripp, Aili. “Combining Intercontinental Parenting and Research: Dilemmas and Strategies.” Signs: A Journal of Women in Culture and Society. 27 (3): 794-811, 2002. Thanks, Aili! I wish I had done some searching in the political science literature (I mistakenly expected nothing to be written there! ).